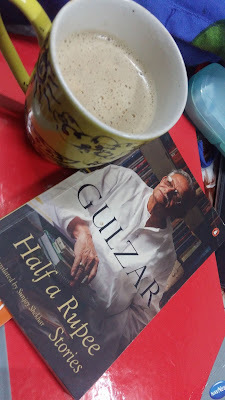 Winter is knocking at our door, the chilling breeze surrounding our soul and books inviting us to their world..
"First of all, an introduction is in order. A greeting, my name is Arka Chakrabarti, a Bengali by birth, I hail from the city of Kolkata and like so many others, I like to write. 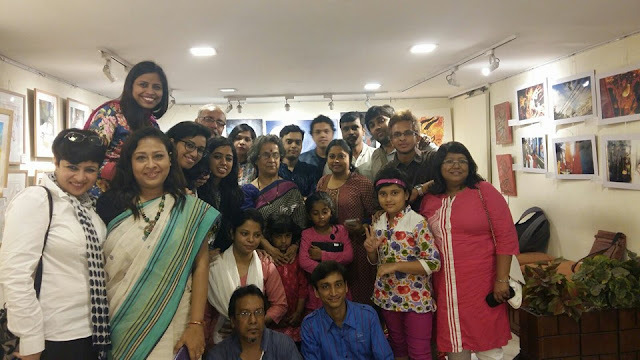 Now that being out of the way, comes the most predictable part where I tell you how tedious a life I lead in the not so adventurous domain of a consultant, the very fate which I have suffered long since my childhood, growing up in an average Bengali family and doing all the very things which, I quote ‘everyone normal person does’. Thus, I am left with the only viable option of romancing nature and making up tales of adventures with the wand of my sheer imagination, a gruesome fate indeed.So I have shared my misery with you and now comes the part of the joy. Suppose, an ordinary human being, who cannot be lured by the concept of ‘what if?’ runs into someone whose life is based on the very same principle, taken to a level of self righteousness at a certain point leading to an aura of grandeur. His very life and body bears witness to the folly, or the biggest question, is it a folly? The answer depends upon the reader and that is my story, ‘IT’S TIME’. Suhail has been a very kind friend and the credit of chancing upon this contest goes to him. He was kind enough to take in the suggestion of the title and after that I just jumped in the bandwagon. ‘Myriad Tales’ is like a tide and I have been sailing since." Q1: What you felt when you won this contest and tell us about your other works? Sadly after penning my first book of ‘The Saga of Agni’, namely ‘The Secrets of the Dark’, this is my first one. But even a sad tale has a silver lining and I have learnt my lessons, I will keep taking part in these marvelous endeavors only for the fact that the experience is simply mind blowing. Q2: Do you think ‘anthologies’ is a good opportunity for young authors to try their hand in the skill of writing? Now that’s food for thought, isn’t it? Anthologies are uncharted territories, whether you sail in that direction or not simply depends upon you, but as those above mentioned questions, the answers of which all of you know, history states that a simple voyage can result into a grand discovery, if only the purpose holds true, which in this case is ‘the love of writing’. Q3: How does ‘genres’ help in building the writing skills? Ans- It has always been said that ‘A pen is mightier than a sword’ and now how you wield it depends upon you entirely. To put in simpler words, when JRR Tolkien started writing ‘The Hobbit’ there wasn’t a ‘genre’ called ‘Fantasy’ or rather it was not so popular to be considered as a literary work in comparison to the other genres. So the simple point is ‘genres’ don’t matter, but writing whatever you want to write and not to force yourself to write what you don’t want to, if it’s from the heart, wrapped in love and affection, it is bound to be a sure winner. Just never forget the ‘love and affection’ part. Q4: What is your way of going about a story? Do you think of a plot first and then build on it or visa-versa? Which genre you like to write on? Ans- It is said in ‘Chaos Theory’ that a butterfly beating its wings in a far away land can stir up a hurricane in another, it may take a very long time but it can happen. God works in mysterious ways? I want to write on all genres if possible, but right now I am working on fantasy-mythological elements with a little mix of science thrown in the middle. 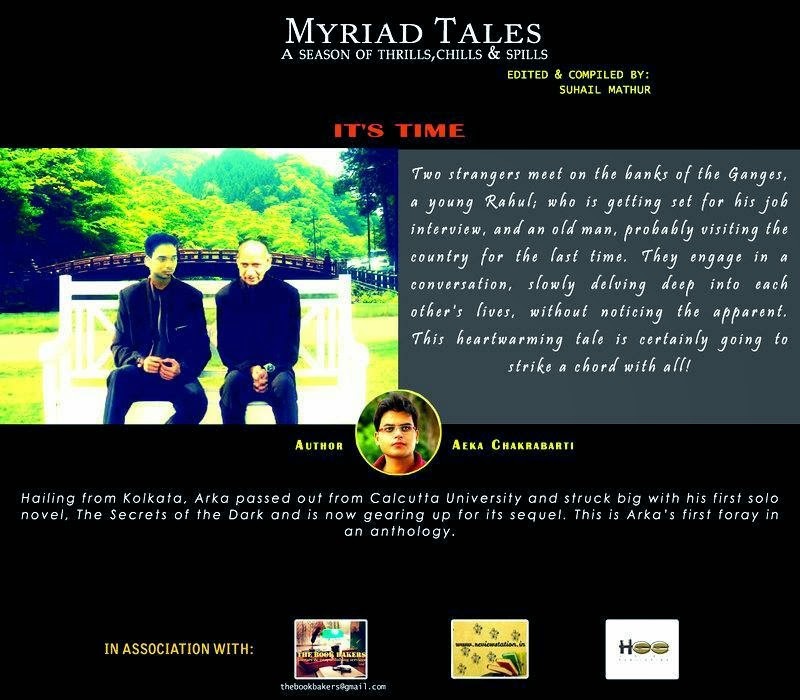 Q5: What do you have to say about the Myriad tales team Suhail,Chetan and Himani? Ans- They are doing a wonderful thing here. They are drawing writers from different origins, from different walks of life, thirty two of them to be precise and gathering them under a single banner, with the sole purpose of creating something wonderful. Suhail is a good friend of mine and I applaud him for his efforts, as well as his entire team. Q6: Any message from a reader that inspired you to write more? Ans- I remember receiving a lot of mails after ‘The Secrets of the Dark’ was published and all of them were very inspiring. I practically had to stay my hand from giving away spoilers of the sequel namely ‘Rise of the Grey Prince’, which is due for a January 1, 2015 release. Each and every one of those mails made me visit and revisit the world of Gaya, to make it better, to make it more intriguing and off course for the sheer love of it. Q7: What is in writing that really draws an author? Ans- I think that it is the other way round; it is the author who is drawn to writing. The experience of writing can be broken into distinct pieces, like thinking, day dreaming, ranting, scribbling and then finally when you piece it all together you get a literary work. One doesn’t simply write to share his or her experience, one writes because writing is an experience. Q8: How has been the response from your friends? Q9: Do you think ‘Being bookworms’ by supporting authors, books, and other literary events is creating a new opportunity for good authors to interact with their creative side and bring readers more closer to them? Ans- Every author/authoress shares a part of his/her soul with the readers and when they complete their work, they want others to read it. When that work is complemented they do not feel pride or prejudice, instead there is a sense of completion, a sense of peace and true happiness. ‘Being Bookworms’ is giving them this very gift, the one they desire the most. What more can I say and how to commend their efforts, I do not know or rather don’t have words for it. But I will simply say ‘Thank you’ as I am an author myself. 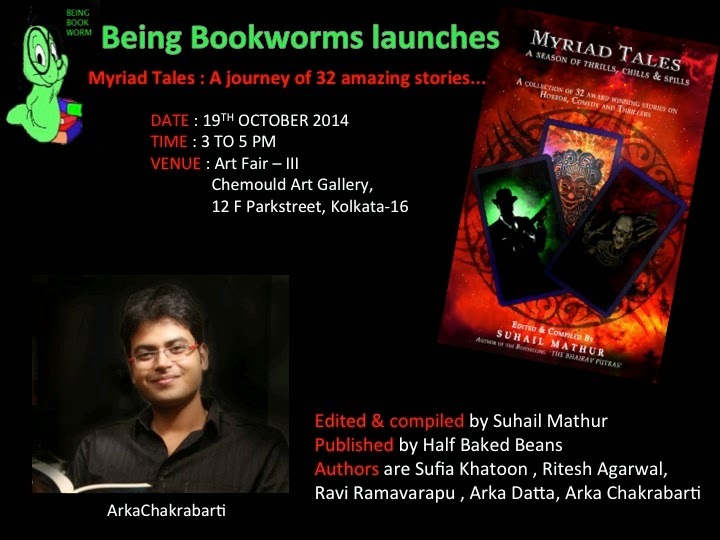 It has been a fascinating journey, getting to know the authors and authoresses of Myriad Tales. I have seen it grow into a sapling from a seed, from the day it was sown, I have seen it being nurtured by the right people and I have seen it spread its leaves in the Sun with time. I only hope and somewhere deep down I know that soon it will blossom as its roots will dig deeper and deeper into the soil. I will wait and see as one day, it’s canopy covers the world. Good Luck to all. What a lovely read. Your answers and thinking, Arka, is as mature as it is unique. The interview has so beautifully captured the author's optimistic attitude that can be inspirational for budding writers. Wonderful!